What a month. I suspect Phoenix will set some kind of record for # of day’s in June over 110F, which was even more delightful on Friday when ash from the Ethan fire (no relation to our dog) was falling on the house… Roy suggested that we go to the neighbor’s and start their fire pit, just to see what hell was really like. 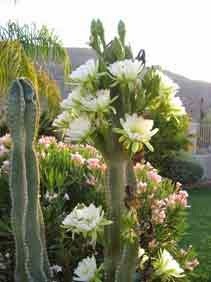 But hot or not, we have had a great display of flowers on our night blooming cereus cactus. I have been busy in the kitchen (as a side note: its way cooler slaving over a hot stove in the air-conditioned house than doing anything outside on the grill). I made Apricot Jam, which didn’t seem very hard… just cook chopped apricots, sugar (2:1 ratio) along with a bit of lemon juice until its jam. I didn’t make much, so it’s just in the fridge for PB&J sandwiches. As a follow-up, I made peach sauce (which is really good on Roy’s waffles). You make this just like apricot jam, but with peaches and you don’t quite cook as long. I bought a bunch of peaches at the farmers market so have more in the freezer… maybe I will try some peach jam later. But I think that this week is the last week we will see peaches a the farmers market (and the apricots are long gone.. but still getting good tomatoes). I also made soufflés for the first time… Its not that hard, but don’t expect it to be a week night staple – way to many dirty dishes. Let me know if you want the recipe. My adventure has been swimming class. The name of the class is the Mile Club (at the Awatukee Y).I figured this meant the goal of the class was to get you to be able to swim a mile. What they really intend is that you swim a mile every class, which includes a bunch of drills where you only do one part of a swim stroke (like breath). I really never realized that there was so much to think about when swimming, its almost as bad as golf. Some of the people can actually swim more than one lap without resting (not me..yet), so the swim coach said she would start teaching us flip turns.. and bring a video camera. Let’s hope she doesn’t post them on youtube. The biggest highlight was celebrating our 25th Anniversary (which sounds much better than a Silver Anniversary, implying that you should have grandchildren and drive a Buick). We celebrated by going to Tucson and staying at the Westward Look (same place we stayed for our honeymoon), and having dinner at Janos. 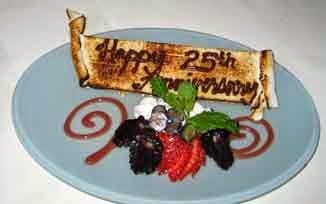 Here’s to another 25!